Roger Caesley: Independent technical consultant specialising in project management for the defence and aerospace industries. Zephyr North: Independent consulting company providing a full range of wind resource assessment services to the wind energy industry. MTMC: Independent consultancy providing market and technical assessments in hydrodynamics, hydraulics and ship design. ANSYS Europe Ltd: develops and licences CFX-5, a Computational Fluid Dynamics software package applicable to marine hydrodynamics. 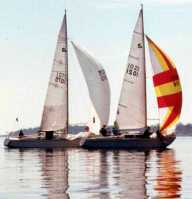 Hugh Welbourn Design: Race yacht designer and specialist foil and CFD consultant. Insensys: Intelligent optical fibre sensing systems for structural health monitoring. Offshore, Power & Energy Ltd: is a dynamic company, specialising in providing Consultant Project Management, technical advice and support services to Offshore Oil & Gas and Renewable Energy projects. Sea-Image Corporation: provides instrumentation for wave climate and surface current monitoring. For coastal monitoring purposes, full directional spectra of waves and surface currents may be measured from a fixed location. Wave measurements in real time may also be taken from ships moving at up to 40 knots, for trials such as ship performance assessment.